Consisting of a circuit of historic cities northeast of Moscow, the Golden Ring (sometimes called the Golden Circle), is a popular tourist route for travellers in Russia. The cities are popular for their distinctive architecture (recognizable for the uniquely-Russian onion-shaped domes and colourful ornamentation), and their tradition of handmade craftsmanship, offering tourists a good opportunity to buy beautiful Russian souvenirs. The official list of towns in the Golden Ring includes Ivanovo, Kostroma, Pereslavl Zalessky, Rostov Veliky, Sergiev Posad, Suzdal, Vladimir, and Yaroslavl. They are all spaced close enough to each other (and to Moscow and St Petersburg) to reach on horseback within 24 hours, making them ideal for a driving tour. The cities are fairly similar, so it is not necessary to visit them all, and most travellers choose to see only four or five. One city that should not be missed, however, is Sergiev Posad, the centre of the Russian Orthodox Church and home to the impressive Sergiev Posad Monastery. 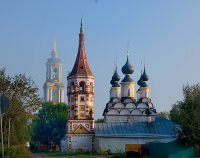 Suzdal is another highlight on any Golden Ring tour, home of the St.Euthymius Monastery and the enormous Spaso-Evfimiev Monastery, which houses 10 museums and is nearly as impressive as St Basil's in Moscow.